In small bowl, combine mayonnaise and basil; blend well. 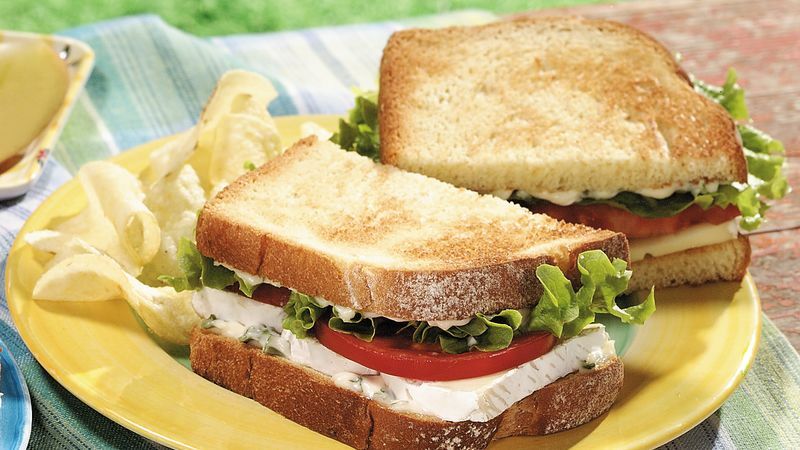 Spread mayonnaise mixture on one side of each toasted bread slice. On 2 bread slices, mayonnaise mixture side up, layer cheese, lettuce and tomato. Top with remaining bread slices, mayonnaise side down. To easily cut Brie, freeze it for 10 minutes, and then use a sharp thin knife. Brie, lettuce and tomato is a common quick-lunch sandwich combination in Paris. Prepare these sandwiches with French baguettes, just as they do in France. Serve them with grated carrots or sliced beets in vinaigrette and a glass of red wine. Missing the original B from the classic BLT – bacon? Go ahead and add it to the sandwich; bacon goes well with Brie.